Before I had my girls I had very few demands on my time and could work uninterrupted for hours on my crafts. I am sure all mothers can remember that time before we had babies and young children to care for and had oh so much time to ourselves. Things have changed and as a result I have had to alter my approach to crafting. Instead of long, uninterrupted afternoons, I now work in tidbits - half an hour here, ten minutes there – little time segments that add up to a whole bunch of creativity. It took me a while to get used to this new approach, but now I love it. I always feel fresh when I am working, and it constantly surprises me how the little tidbits of time add up to me getting a lot of crafting done. 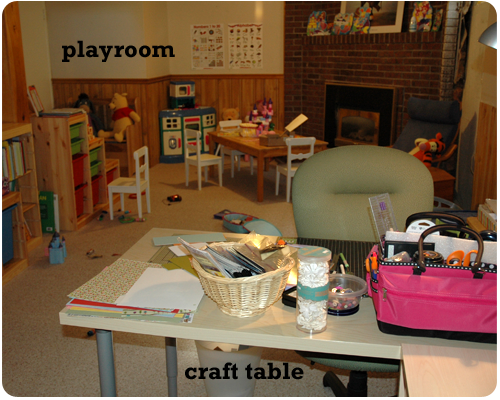 My craft table is in the corner of the playroom and I always have one or two projects on the go there. I can work on these projects while my girls are playing and be right there if they need me. I involve my girls in my crafts. This is especially true of scrapbooking. They both love to cut and paste paper together, add pictures and stickers and then write or scribble the corresponding story on the page. And it just fills my heart with joy to see what they have gleaned from watching me. Their pages are really good. I sometimes work on a project on the kitchen counter. 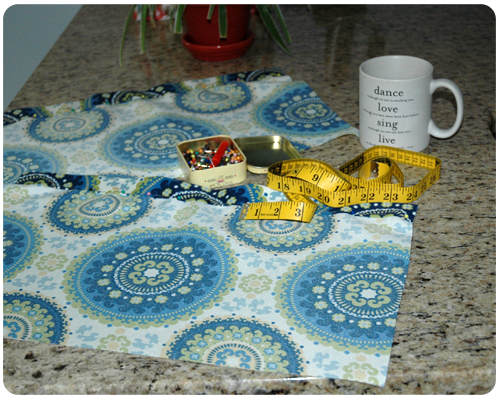 Here I was pinning a sewing project while dinner was simmering on the stove. 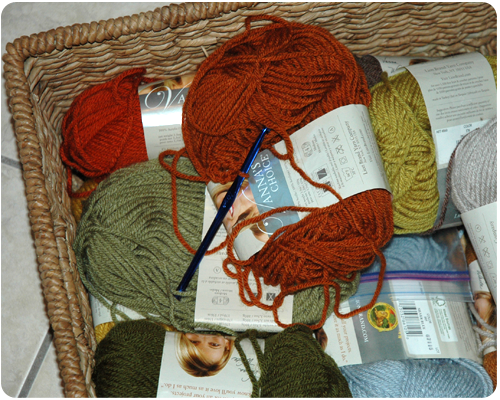 I always have a crochet project in a little basket or bag, ready to be picked up during the spare moments of my day. Finally, I save all the complex craft projects that require my full attention and concentration for when the girls are sleeping. I figure there is no sense in getting frustrated by trying to spray paint something and then be interrupted by someone needing a snack or bathroom break. Now all this being said, I would definitely sign up for a full day of uninterrupted crafting. But until then, my tidbit approach allows me to get my crafts done. And that makes me very happy! What do you do to allow yourself time to craft while caring for your children? Please share any tips you have. We could all use new tips and advice for getting things done, am I right? Great ideas! I do most of my crafting in the summer with help from my teens, but I enjoy those "tidbits" on the weekend as well. Thank you, Ginger. The summer is definitely a great time to get crafts done!